didnt spend much time checking this, so somebody might wanna check it. 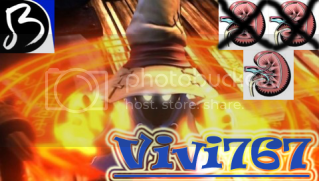 the only part im not confident about is the ninelet, but thats the only way i could think of it. I have transcribed a bunch of mcm 09 book just now, but it's only handwritten. I will be entering it into Sibelius later and posting it in the next 1-2 days. I would do it tonight but we have auditions! rudlka89 wrote: The ones who are good enough will find a way. The ones who aren't will find excuses. germmeetsworld wrote: I have transcribed a bunch of mcm 09 book just now, but it's only handwritten. I will be entering it into Sibelius later and posting it in the next 1-2 days. I would do it tonight but we have auditions! ok then we can compare our transcriptions. The MCM 2009 Solo Lick. I also wrote past the lick to the end of it. 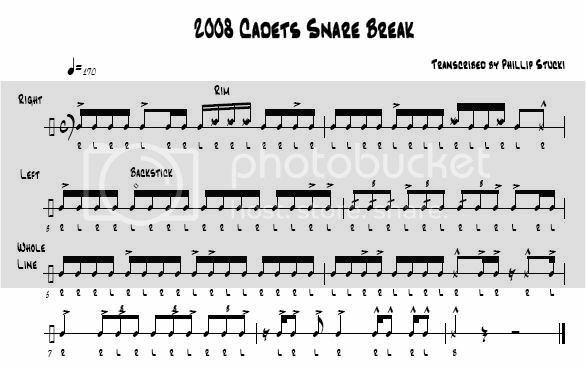 does anybody have the Cadets 2008 drum feature?? FCHSsnare2011 wrote: does anybody have the Cadets 2008 drum feature?? Jeez, I just wanna say very nice work to everyone submitting. This thing's growing quite fast. I know that some of the time sigs seem weird, but I have the quad music and the rests where this solo falls in matches up time wise. Hi, I'm Raul, and I have 3 kidneys. "Pedicabo ego vos et irrumabo." See below for Rhythm X 2009 snare book. We've finally done it, guys! Last edited by AWA on Sun Jun 14, 2009 8:26 pm, edited 1 time in total. ...You might want to put the quad part of the opener back up. Lol. Heres a chunk of the Blue Stars drum feature from last summer. The beginning may be a bit off, my apologies, but the rest should be pretty close. Last edited by FurySnare on Sun Jun 14, 2009 7:34 pm, edited 1 time in total. FurySnare: Not working for me. Last edited by AWA on Sun Jun 14, 2009 8:40 pm, edited 1 time in total. Also, Panasonic, you got rid of all of the RX stuff from years other than 2009. Just sayin'. how do you open a rar file? Google WinRar... it's a free download. In a month, it will say you need to buy it. Don't bother, just hit close. Don't download the above link, I made a mistake.